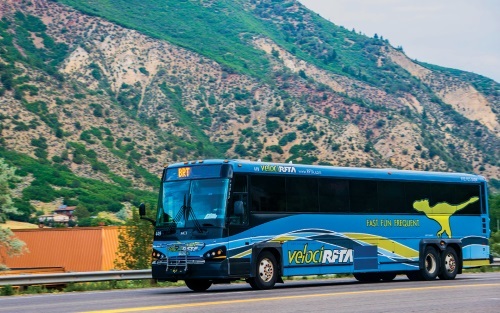 The Federal Transit Administration awarded a $2.2 million competitive grant to the Roaring Fork Transportation Authority in Colorado on Oct. 2 – one of the nation’s largest rural transit agencies – to buy new vehicles for its bus rapid transit or BRT service. The agency also recognized six rural transit systems that “exemplify good community service” with its Administrator’s Award for Outstanding Public Transportation Service in Rural Public Transportation on Oct. 1 during the biannual National Conference on Rural and Intercity Bus Transportation in Breckenridge, Colorado. RFTA received its $2.2 million grant via FTA’s Bus and Bus Facilities Infrastructure Investment program, designed to help transit agencies nationwide replace and rehabilitate buses and bus infrastructure. The money will go toward buying new buses for the VelociRFTA BRT line, which opened in 2013. FTA noted that a total of 107 projects in 50 states and territories will receive $366.2 million in funding from FTA’s Bus and Bus Facilities Infrastructure Investment program, with Colorado getting $15.9 million worth of such grants. Altogether the agency said more than 41 percent of the selected projects getting grants via this program are in rural and small urban communities. Wells County Council on Aging in Indiana. North Central Regional Transit District of New Mexico. Crawford Area Transportation Authority in Pennsylvania. Spartanburg Regional Healthcare System of South Carolina. Prairie Hills Transit in South Dakota.